We can report people’s words by using direct speech or indirect speech. Direct Speech: Exact words of the speaker. We use quotation marks (‘ ‘). 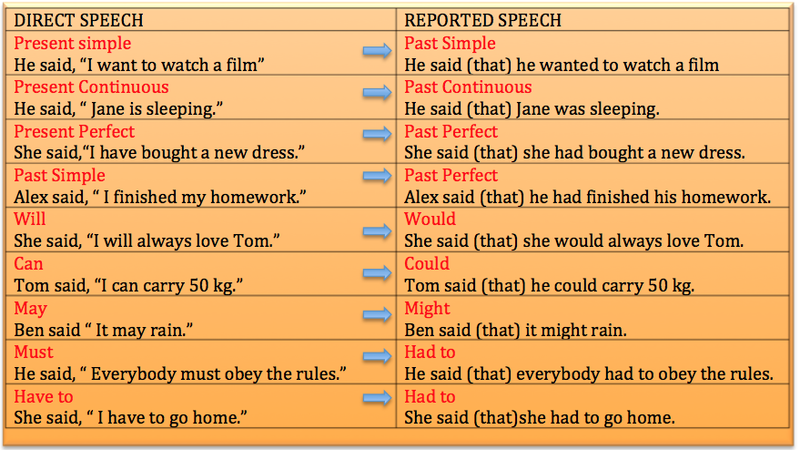 Reported (Indirect Speech): Exact meaning of what someone said but not the exact words. We do not use quotation marks. 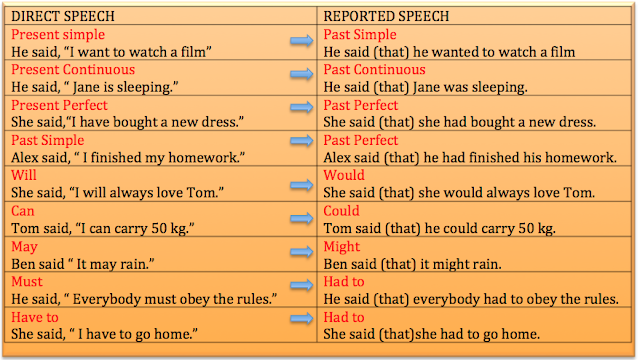 While reporting someone’s sentences we start the sentences generally with some verbs like “say, tell”. eg: Tom said that it was nice to be at home. Say is used with or without personal object. Eg: He said (that) he was Ted. He said to me (that) he was Ted. Tell is always used with a personal object. Eg: He told me (that) he was Ted. NOT He told (that) he was Ted. 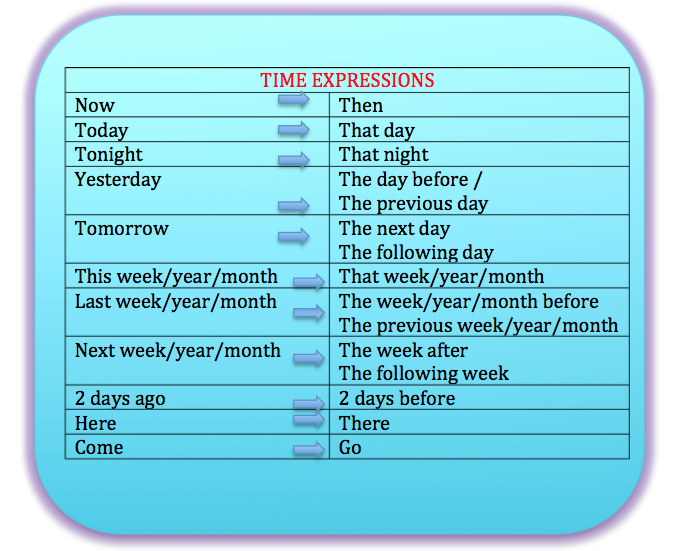 We report someone’s sentences after some time. Because of this, in reported speech we change personal pronouns, possessive adjectives/pronouns, verb tense, and time expressions according to the meaning of the sentence. Sam said that he was flying to Italy with his family the following day. COMMANDS:In commands and instructions, we generally use “order” or “tell” instead of “say”. As these are imperative sentences, we cannot make any change in tense. The police ordered the man to put the gun down. The teacher told students not to speak during the test. REQUESTS: In requests, we generally use “ask” or “beg” instead of “say”. Jack asked Jane to help him. The boy begged Mrs Brown not to call the police. SUGGESTIONS: In suggestions, we generally use “suggest -Ving” or instead of “say”. 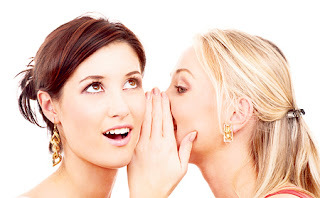 In questions, we generally use “ask”, “inquire”, “wonder” or “want to know” instead of “say”. WH QUESTIONS: When questions start with WH words reported speech sentence is introduced with the same word but the question should turn into a normal sentence order. Jill asked me what I wanted to know. Bill wanted to know how I had solved the problem. The boss asked why I wanted this job. YES/NO QUESTIONS: Reported yes/no questions start with “IF” or “WHETHER”. The question should turn into a normal sentence order. Tom asked IF / WHETHER I had seen him before. Bob: “Can you speak more slowly? Bob asked me IF / WHETHER I could speak more slowly. Bryan wanted to know IF / WHETHER my hotel was near there.